Burrito Bowls is a dinner that I make when I have left over chicken, pork, or beef leftover and want to turn it into a yummy meal that doesn't scream :"LEFTOVERS!". It's a perfect dish when you have extra Mexican Chicken Mix. I really have no secret recipe here, but I'll share with you what I do to throw this together. 1) Throw some minute rice into the microwave enough for your family. I use brown rice. 2) Decide on your toppings. I don't like mine too dry, and make a quick bowl of Avocado & Corn Salad. It's not too hot (unless you want it that way) and has beans, corn, tomatoes, onions, I even chopped up a zucchini really small from the garden and threw it in there. But the dressing for this "salsa" keeps the dinner super moist. 3) heat up your leftover meat. 4) Pull your sourcream, cheese, &/or guacamole from the fridge. Jan's Tip: Grab 4 avocado's when you go shopping. Chop two up in the Avocado & Corn Salad and keep two to make a quick guacamole. 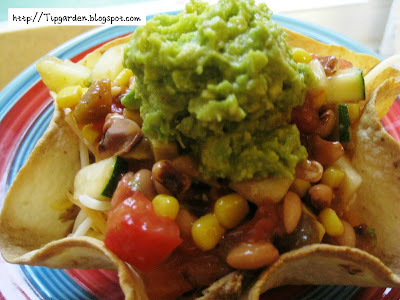 Let everyone layer their own bowls anyway they want, and serve it with tortilla chips. This quick dinner can be thrown together in less than 30 minutes.